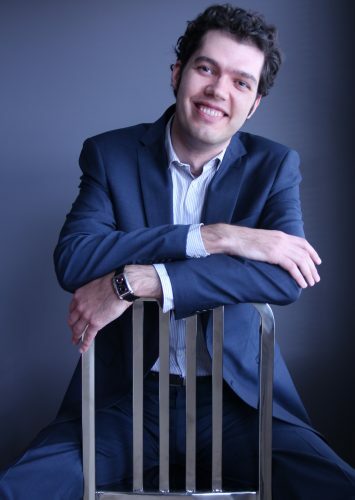 Passionate about imparting his musical excitement and knowledge, Dr. Bogdan Dulu is an active and experienced performer, educator, and adjudicator. Dr. Dulu received a rigorous foundation in the fundamentals of music through specialized education in his native Romania. This led to his orchestral debut at age 12 in a concert broadcast nationally by the Romanian Radio Corporation. It was this institution that significantly contributed to making his name recognized across the country, through multiple live broadcasts of solo and orchestral performances, interviews, and several studio recordings. His recordings represented the Romanian Radio at the Concertino Prague (1997) and EURORADIO New Talent Bratislava (2006) competitions. He received the Gold Medal at the 2011 Seattle International Piano Competition and won the 2005 Yamaha Prize in Romania, followed by wins at the 2006 Liszt-Bartok Competition (Sofia, Bulgaria) and the 2007 William Garrison International Piano Competition (Baltimore, USA). Other international competitions include Helsinki (Finland), New Orleans (USA, semifinalist), Honens (Canada, quarterfinalist), Sendai (Japan), Enescu (Bucharest), and e-Competition (USA), among others. An active performer, he could be heard in Europe, North America, Asia, and Africa. He is equally at home as a soloist, chamber musician, collaborative pianist, coach, or public speaker, with appearances on NHK Tokyo, YLE Finnish Broadcasting Corporation, and KING FM Seattle. His most recent engagements included a concert tour on the Canadian East Coast presented by Debut Atlantic, as well as performances with British actor, Tayo Aluko in “Call Mr. Robeson,” a mono-drama about the life of famous American actor, singer, and civil rights campaigner, Paul Robeson. As an educator, he was invited to present piano masterclasses and lectures at Dalhousie University (Halifax, NS), University of New Brunswick (Fredericton, NB), and Douglas College (New Westminster, BC). He has also participated in children’s music outreach programs in Eastern Canada, Japan, and Botswana. Of note is his association with Marc-André Hamelin, with whom Dr. Dulu worked closely during his final stages of his doctorate. Dulu is the first pianist to have written a doctoral dissertation on Hamelin’s infamous Études, researched under the personal guidance of the composer. He also received coachings from Yefim Bronfman, Richard Goode, Stephen Hough, and worked with soprano Dawn Upshaw at the Banff Centre. After studying privately with Ana Pitiş in Bucharest while pursuing his Bachelor’s degree, Dr. Dulu continued his training with Irina Morozova at Mannes College (Master of Music) in New York City, and with Jane Coop at University of British Columbia (Doctor of Musical Arts) in Vancouver. Dr. Dulu is on the piano faculty at the Vancouver Academy of Music and is a Jeunesses Musicales artist for the 2016/2017 touring season. He makes his home in Vancouver, BC where he becomes a little more Canadian by the day.